ANVER’s Compressed Air Powered Welding Hold-Down Clamps are production quality tools designed for jobs requiring continuous use. These clamps quickly remove the gap between the plate and the stiffener. They eliminate the need for lugs, chains, c-clamps, or tack-welding and regrinding from the welding operation. The suspension rods are hardened while the frame is made of high tensile steel for maximum strength. The attach and release is extremely fast. The units are powered by an air venturi which is silent and efficient. 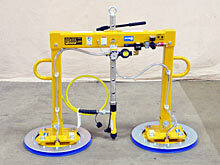 The three largest units feature rugged bolt-on style pads with extended pad covers to protect the sealing rings. The ENERPAC® hydraulic ram is of the highest quality to minimize the chance of leakage. 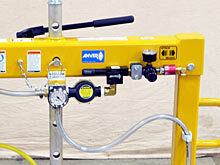 A suspension hook allows the hold-down clamps to be easily positioned. 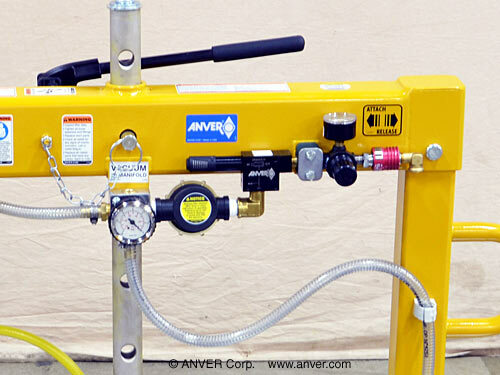 ANVER Compressed Air Powered Welding Hold-Down Clamps are supplied with a self contained hydraulic ram and pump that develops compressive force to help increase welding production and significantly reduce time and labor costs on a variety of welding operations. Welding operations include welding beams to plate or in the fabrication of tanks, cylinders and heavy structural sections. They also are an ideal means of raising a sagging plate to beam level. Welding of U-brackets and the use of wedges can be eliminated. There are no brackets to knock off or tack welds to grind when the welding operation is completed. The welding hold-down clamp is positioned over the sections to be welded. The vacuum attachment pads, powered by a compressed air venturi, are then activated, creating the holding force. The operator is able to accurately position the pieces to be welded while the hydraulic ram holds the pieces tight, helping to make a secure weld possible. A quick vacuum release valve permits movement of the unit to the next welding point quickly and easily. Solid machined steel rods provided for pad suspension. Welded, steel tube frame provides maximum strength and eliminates any chance of distortion. Steel reinforced clear PVC hose, stainless steel clamps and brass fittings used throughout. * Rated load at 24 in. Hg, with a 2:1 safety factor on vacuum holding. Custom Welding Hold-Down Clamps also available.